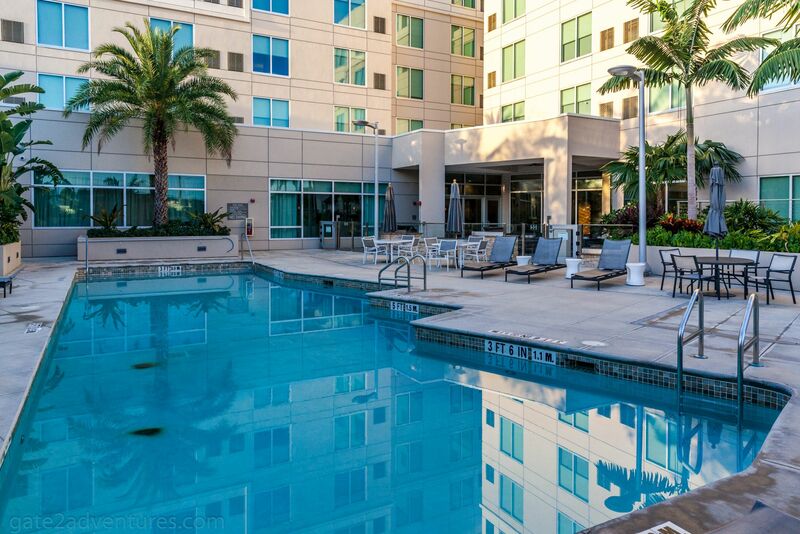 Another trip to Miami and this time another new hotel to try out. 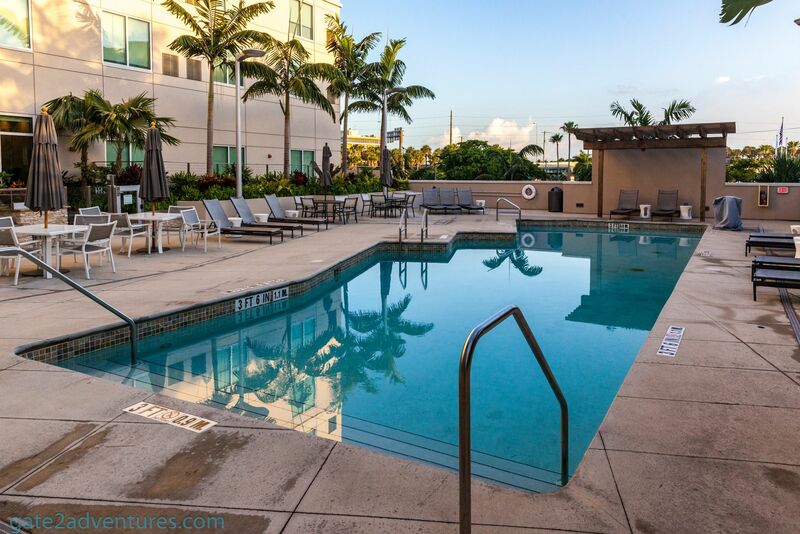 I have my favorite go-to hotels in the city either in Miami Beach or Miami. 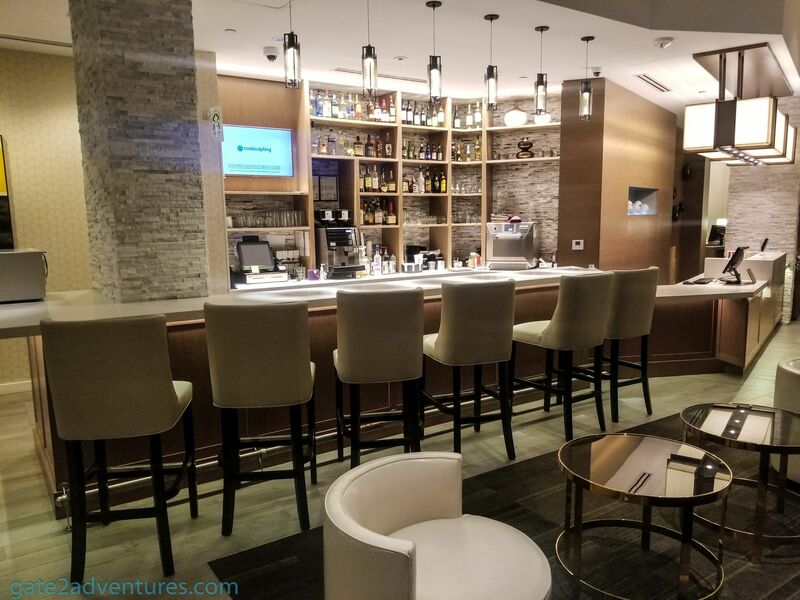 Depending on price, availability and actual project site, I usually stay at either the Hyatt Regency Miami Downtown, Element Miami International Airport, The Confidante – Hyatt Unbound Collection. 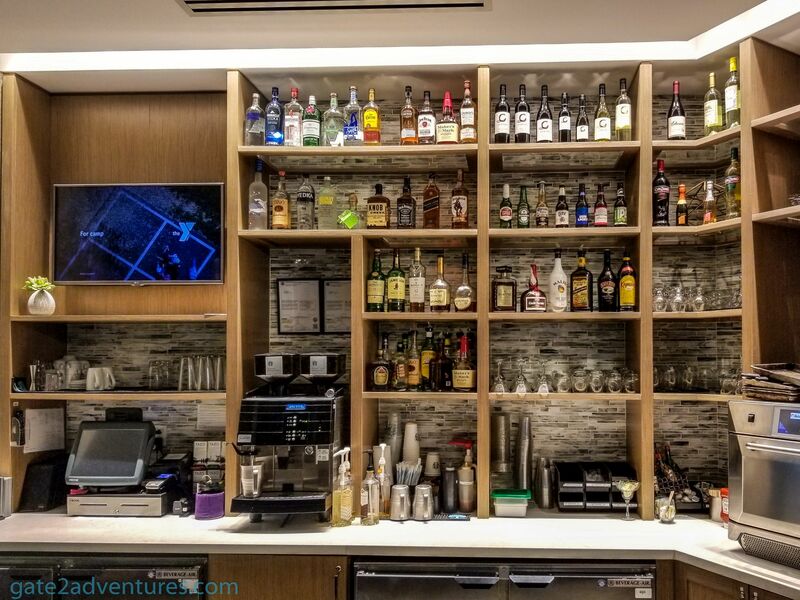 There are many more hotels I want to try out in both cities and this time I decided to stay at the Hyatt Place Miami Airport East for two reasons. 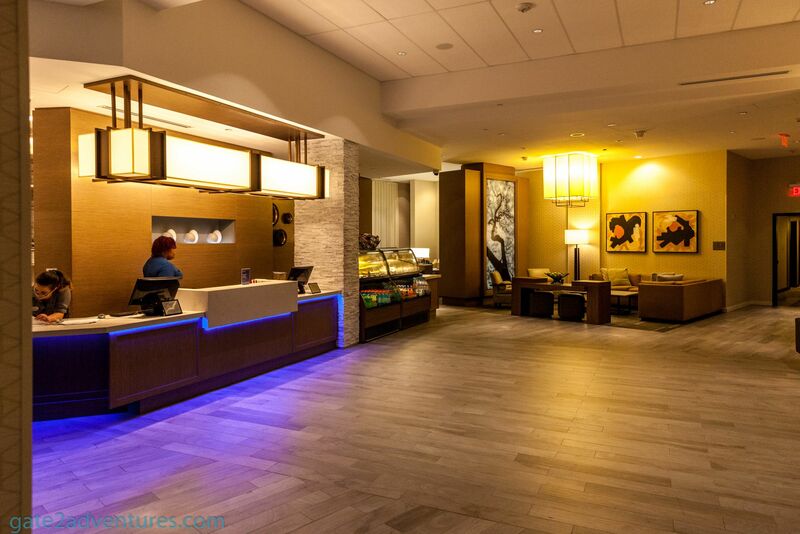 American Express and American Airlines have a promotion currently running for some nice bonuses while staying at a Hyatt Place or Hyatt House. In this case, I would double-dip and qualify for both promotions with a single stay. Can’t beat that. And of course, I am a big Hyatt fan. After arriving in Miami and picking up my rental car at the rental car center it was a very short drive to the Hyatt Place. The hotel is basically in walking distance of the rental car center. Finding it was no issue, as I drove the nearby street many times and knew the hotel was there. Once in the parking lot, I pulled up to a little parking bay right in front of the main entrance. This is usually the spot, where the airport shuttle will drop off and pick up passengers. There were some additional parking stalls outside the bay, but all occupied. When you walk into the building you can take the staircase up to the lobby level or you can use the elevator to your left, which only goes up to the lobby level. The lobby is located on the second floor in this hotel but is marked as “L” in the elevator. Ground level with the main entrance and parking is marked as “G” on the elevator dash. The stairs and elevator to your left lead up to the lobby. To access the elevators on the right you need a room key. I arrived just a few minutes before 11 p.m. and I was the only one checking in and even in the lobby. Checking me in was quick as usual, all my info was already pulled from my Hyatt loyalty profile and I got my keys handed to a room on the 5th floor. Parking here is charged with $20/night for self-parking. To park your vehicle you have to go downstairs and talk to the valet. He will give you a piece of paper you have to put on the dash of your vehicle. There is covered parking underneath the building and to get in the valet has to open it with his remote. He told me I can park in the covered lot or anywhere outside around the building. Small advice. The covered parking area is a one-way street. The gate you came in is only to enter, the exit is just around the corner. I didn’t see it when I arrived in the middle of the night and found out the hard way when I pulled up to the gate the next morning. After I parked my car, I went into the building and to the right to access the elevators to all floors. To get access here, you have to use your keycard to open the sliding doors. Once inside, you don’t need the keycard anymore to activate the elevator. The first thing I noticed was the two floor to ceiling windows. Both of them take up pretty much the whole side of the room, except for the little part of the A/C unit. Each window comes with a solar shade and a blackout shade. The room is facing the airport and you can view the planes land and take off. Depending on the wind direction. The close proximity to the airport makes this also a bad spot if you wake up easily by loud noise or have other sleep issues. The hotel is close to the flight path of runway 26R/8L. 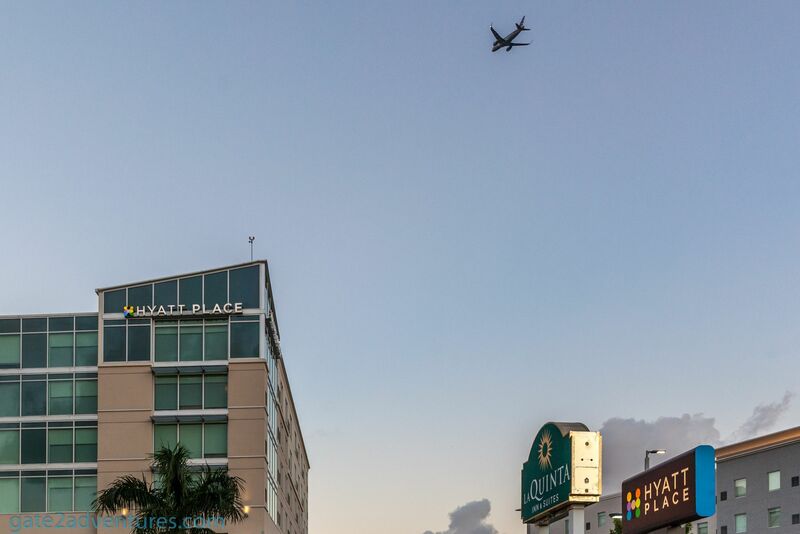 Usually, the planes at MIA take off towards the ocean, this means directly heading your way at the hotel. The small planes are no issue as the gain altitude quick and don’t need as much runway to lift off. The bigger planes are the issue, they need more runway and therefore will be lower when they pass by the hotel. These planes also tend to be louder than the smaller planes and you get to hear that very well here in your room. I don’t know if it is much different in the other hotels nearby, but at the Hyatt Place Miami Airport East, I can see that be an issue. The room is smaller than expected. 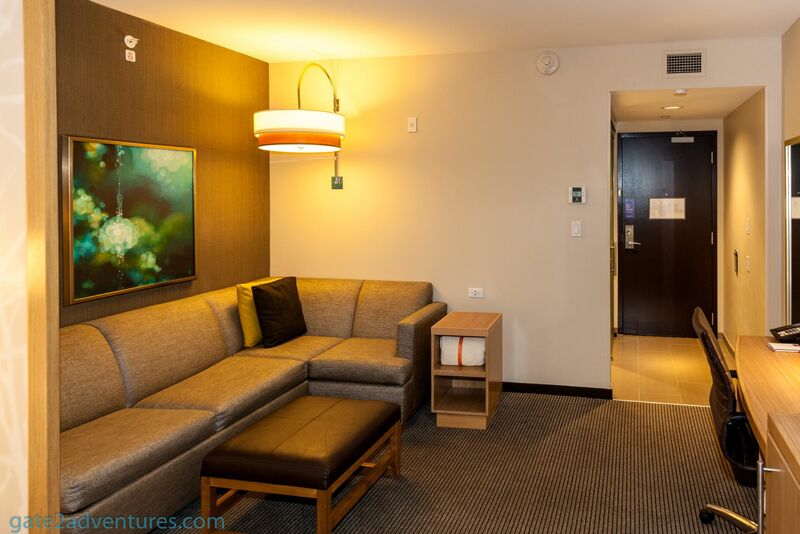 I have been to many Hyatt Places all over the country, and I expected a bit bigger room. Don’t get me wrong, it’s still a nice and pretty big room considered. Especially if you just use it for your layover or the day before or after your flight. And that’s what this hotel mainly is, a transit hotel. You don’t stay here for your vacation, there are better places in the area. Immediately to the right after entering the room is the well-sized bathroom which is separated by a sliding door out of frosted glass. 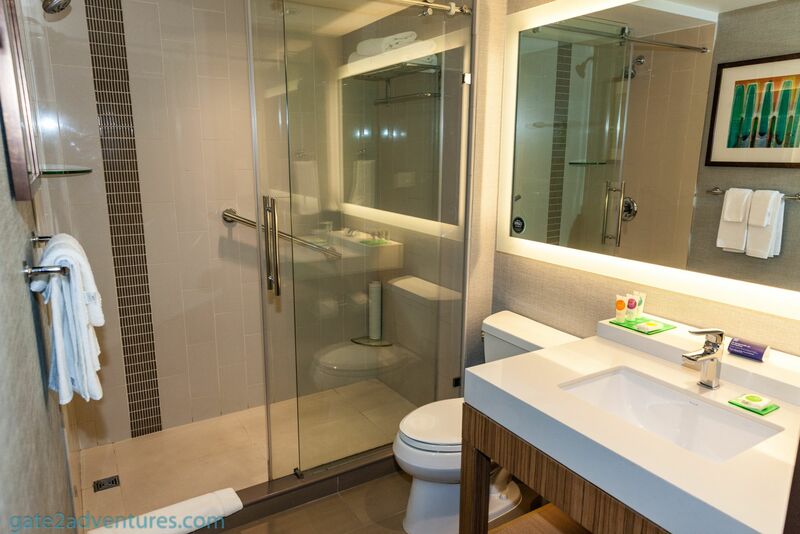 The bathroom is well proportioned and has a walk-in shower with a sliding door with clear glass. Followed by the bathroom, is the “cozy corner” with a corner sofa-sleeper followed by the King bed. 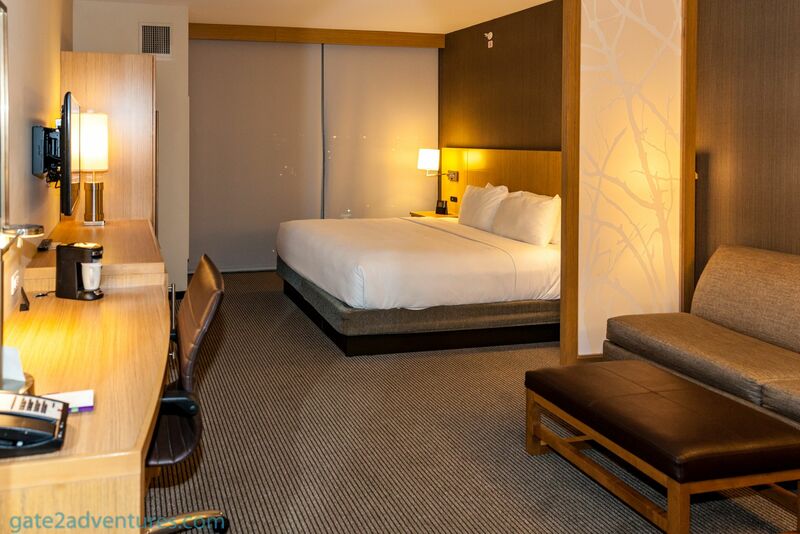 Plenty of power outlets and USB ports are provided on either side of the bed to charge your devices. Adjacent to the bed is a closet with a safe, iron, ironing board, and extra bed sheets. To the left of the tall closet is a small cabinet with drawers to store your clothes followed by a door in the same cabinet, which hides the refrigerator. Following the cabinet is a small work desk. On top of it a room phone, reading light, and a coffee maker. The coffee pads, cups, sugar, cream,… are on a shelf below the desk. There is also a set of glasses and a bucket for ice. As mentioned, the lobby is actually on the second floor. The lobby layout is great. 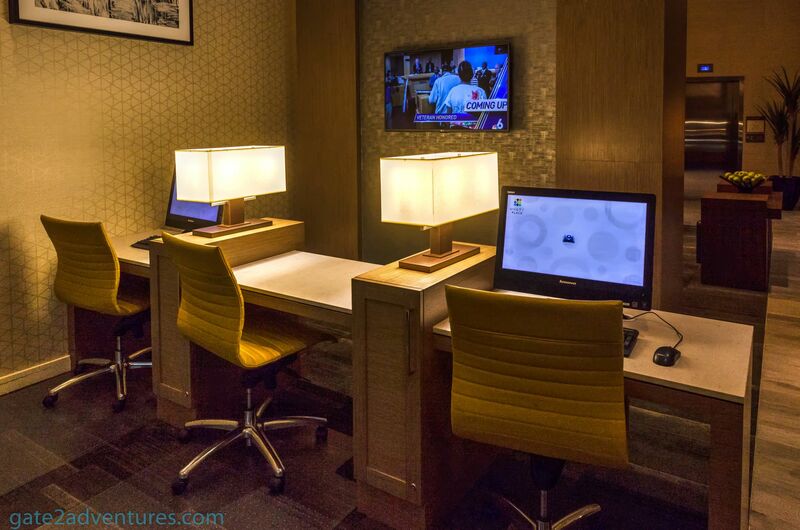 One corner has a business center, with workstations and a printer and in front of it a sit-down area with chairs. 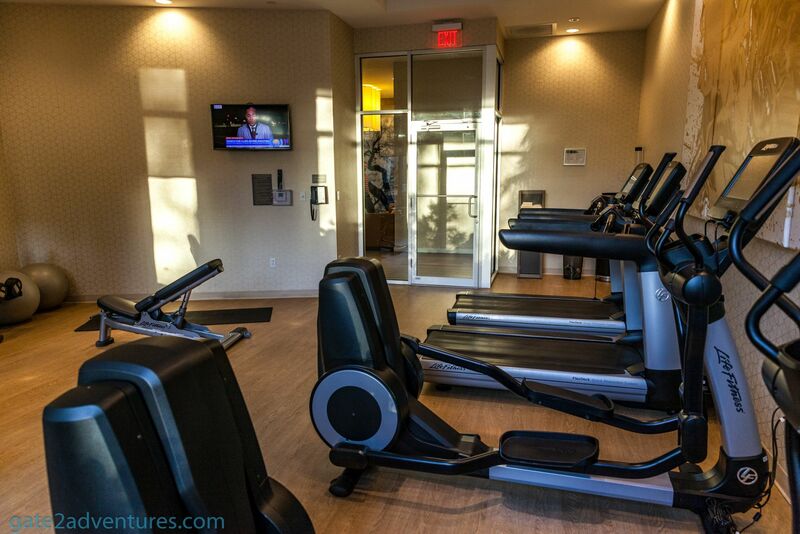 On the other side of the hallway is the entrance to the fitness center. 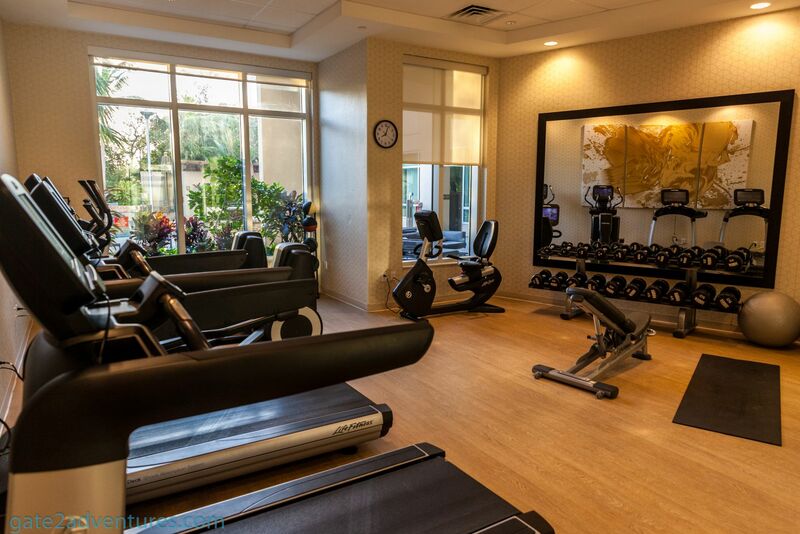 It is pretty well outfitted with workout equipment and has a view of the terrace and pool area. Besides having a meeting room on the same floor there is a huge outdoor terrace with the outdoor swimming pool. 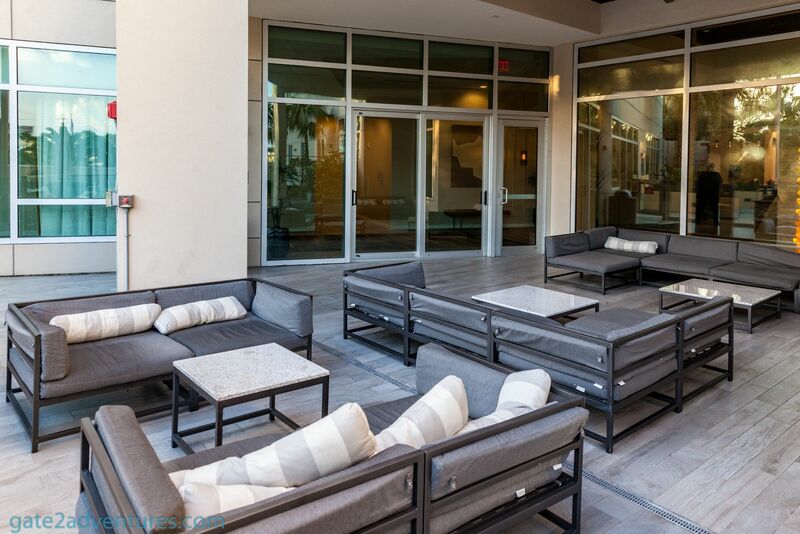 The terrace has a fire pit area with a decent amount of chairs and loungers. 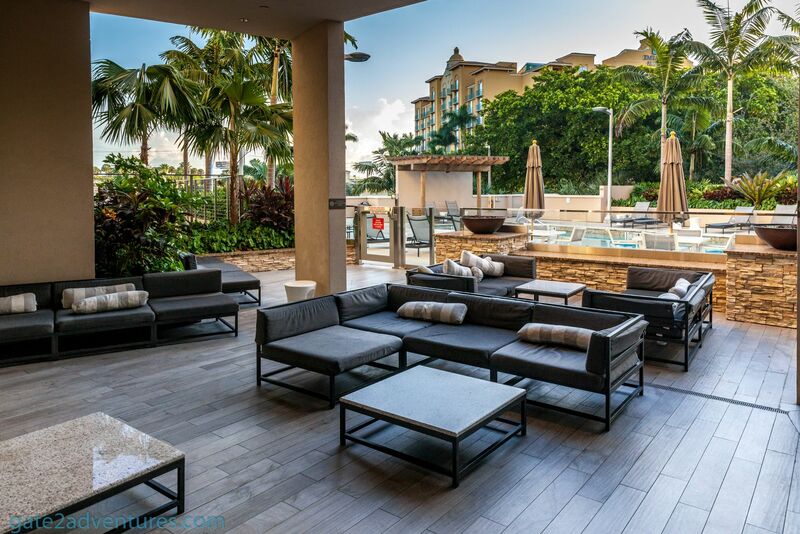 Perfect for a great Miami evening get-together. 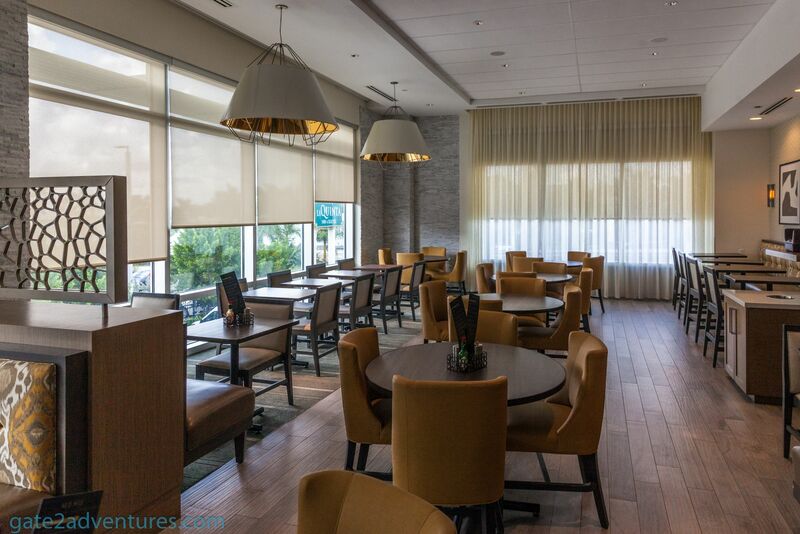 The breakfast area is spacious and lots of places to sit down along the big floor to ceiling windows with a partial view of the airport. 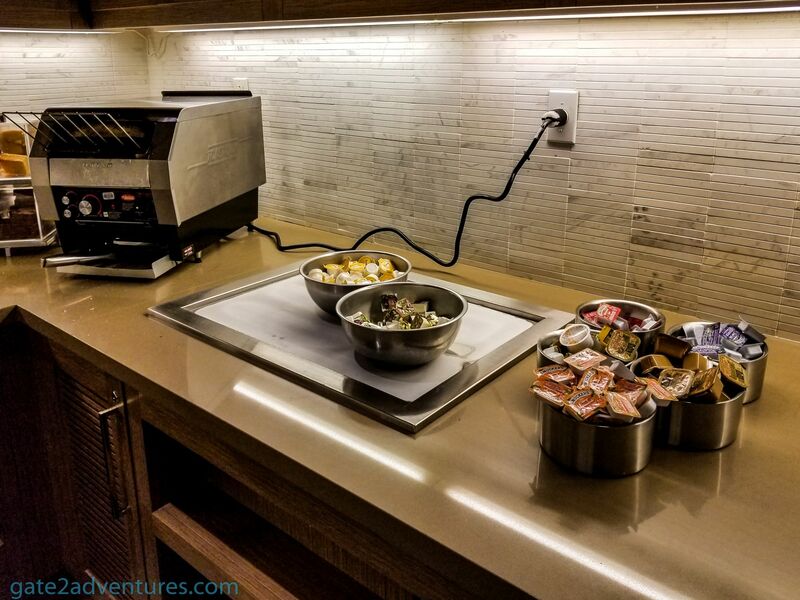 As for breakfast, it is the usual setup as you know it from a Hyatt Place. 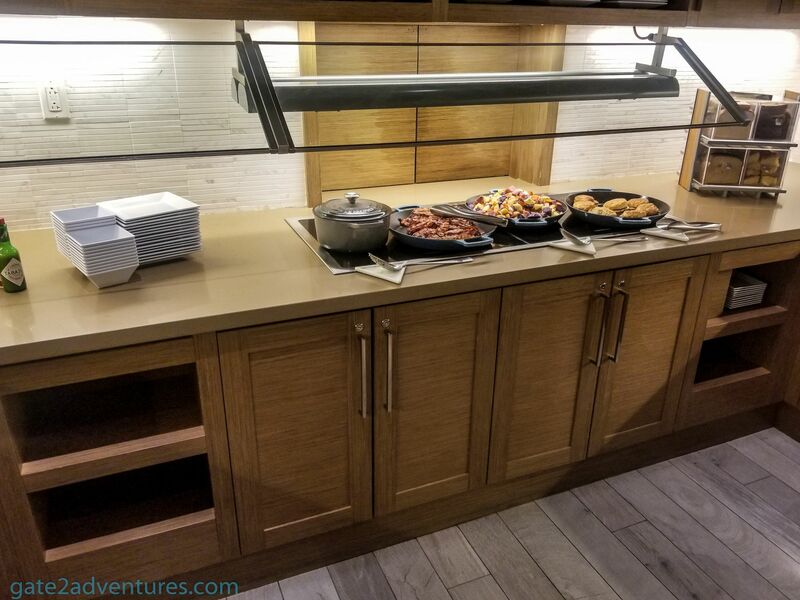 A big U-shaped buffet area serves the breakfast buffet. One thing I kinda found odd was that they have the peanut butter in a huge glass jar rather than small individual packages. A few days into my stay they changed from serving jelly and peanut butter in jars to the pre-packed portions you are used to. 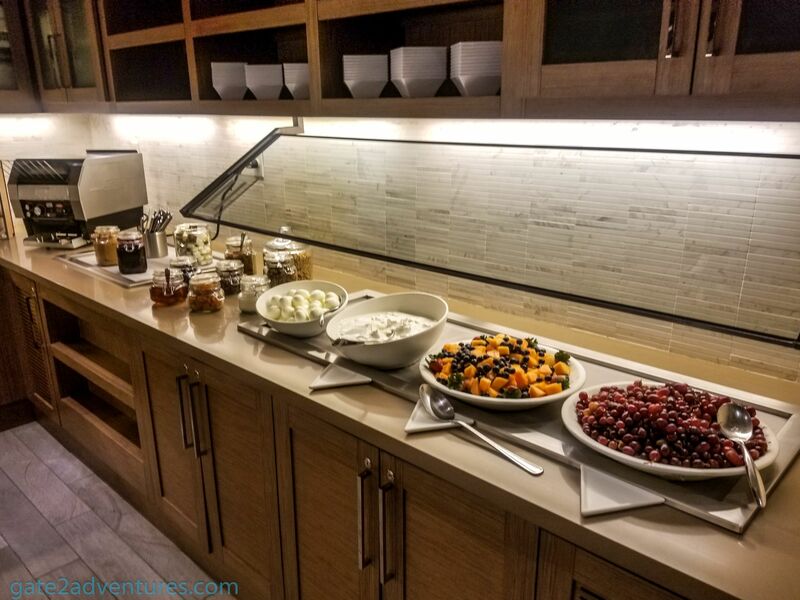 The breakfast buffet comes with a lot of different fruits as well. 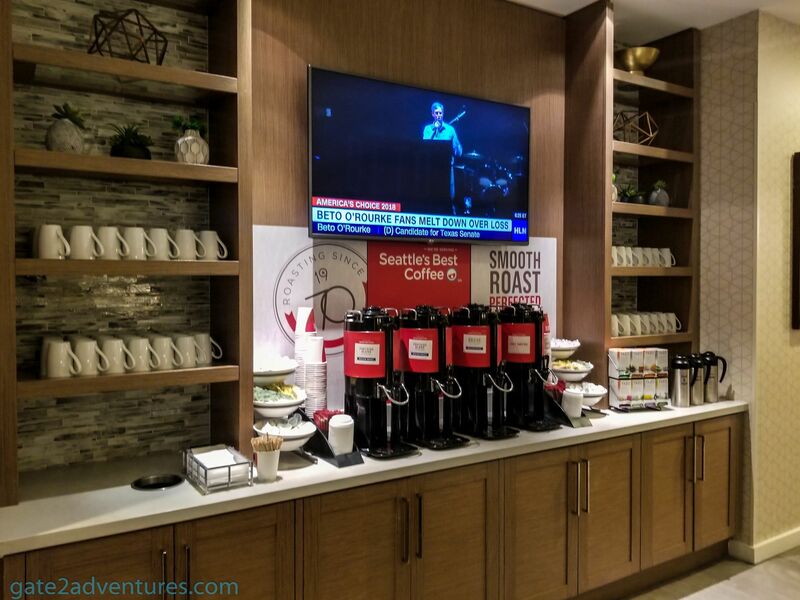 Coffee is located adjacent to the buffet area along the wall. Unfortunately here as well, they only serve half & half creamer and no flavored creamers for the coffee. 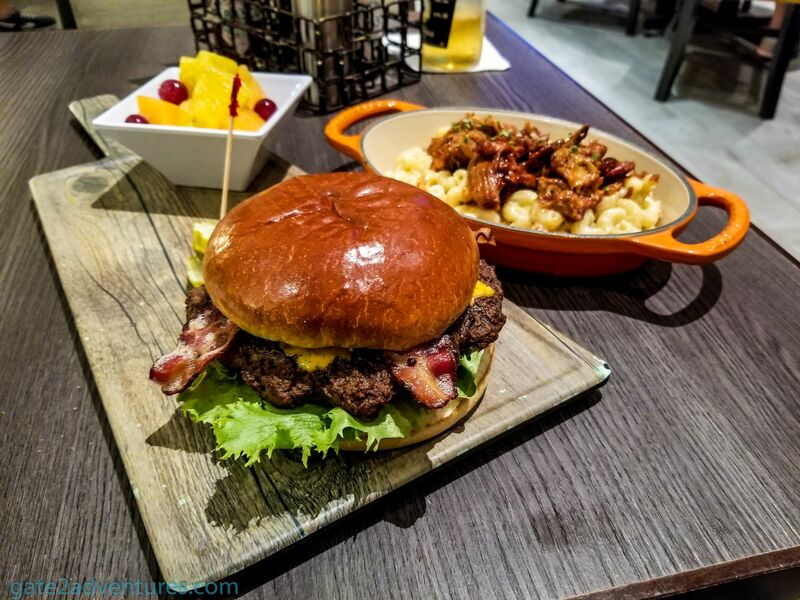 Breakfast is for free for World of Hyatt members. If you are not a member, just sign up really quick any time during your stay. 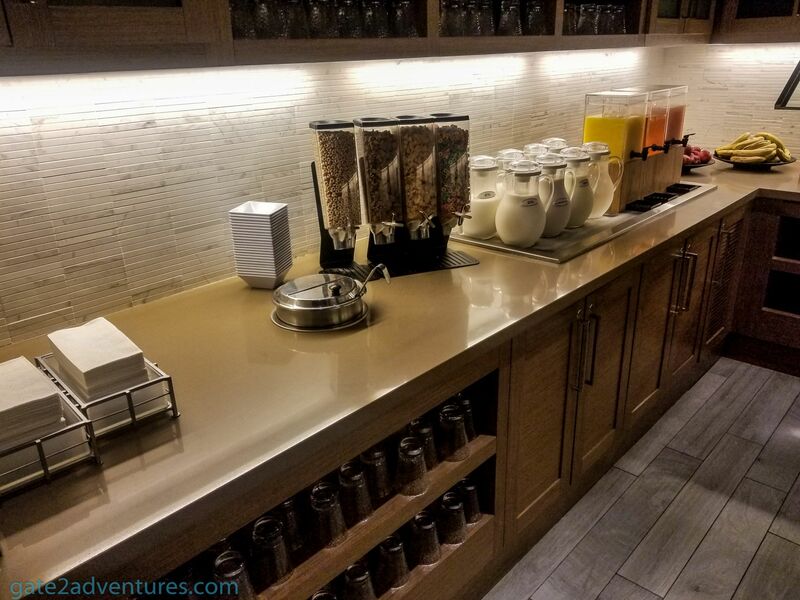 You don’t need to have any tier level to get free breakfast, just a loyalty account number and have it added to your reservation. 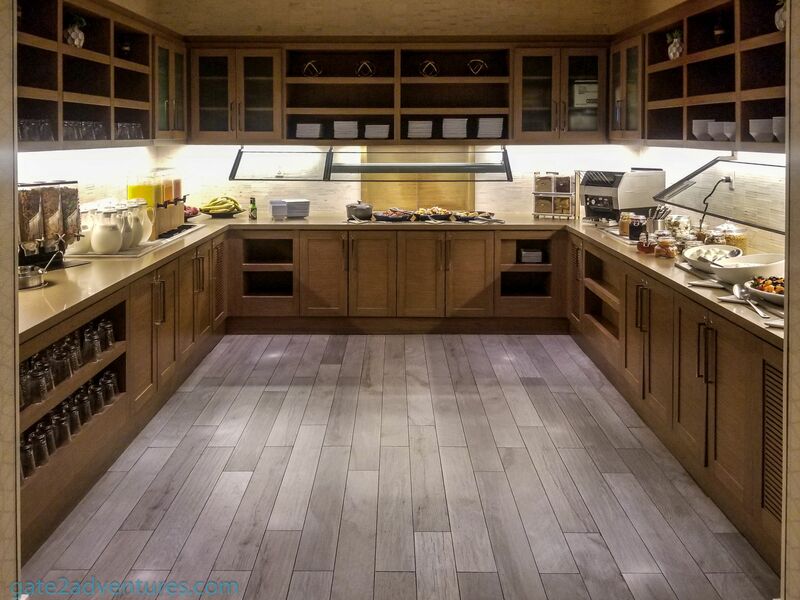 You will thank me later for earning points with this stay, as Hyatt has some great properties to redeem your points at. On the contrary, is anyone checking it? Probably not, but let’s just be all honest and follow this simple rule. The Gallery Menu is open 24/7 and has a good selection of snacks salads and bigger bites. 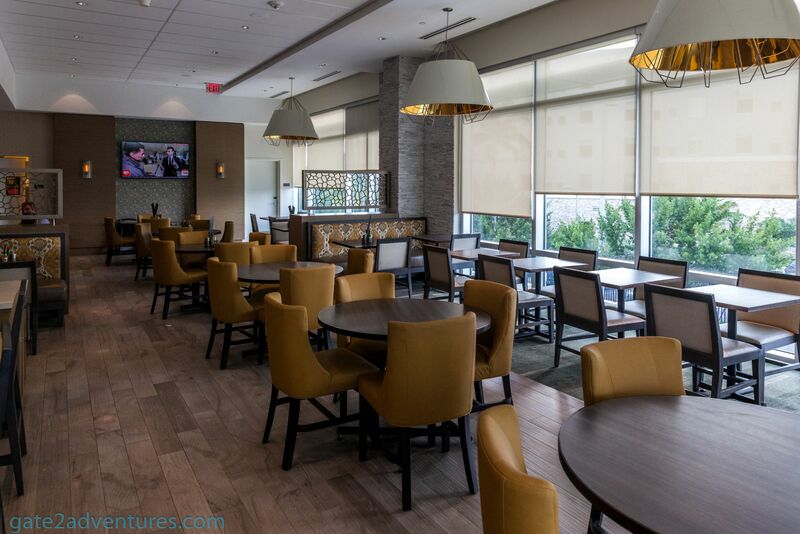 Grab a beer or wine at the bar and have a relaxing evening. Service in the gallery was good despite that they had a whole group in having dinner all at once. I ordered a burger and the “Pulled Pork Mac & Cheese”. The combination of pulled pork and mac & cheese is amazing and it tasted great. Not so much for the burger. It tasted dry and the mixed up my order as I ordered without tomatoes and guess what was on the burger? 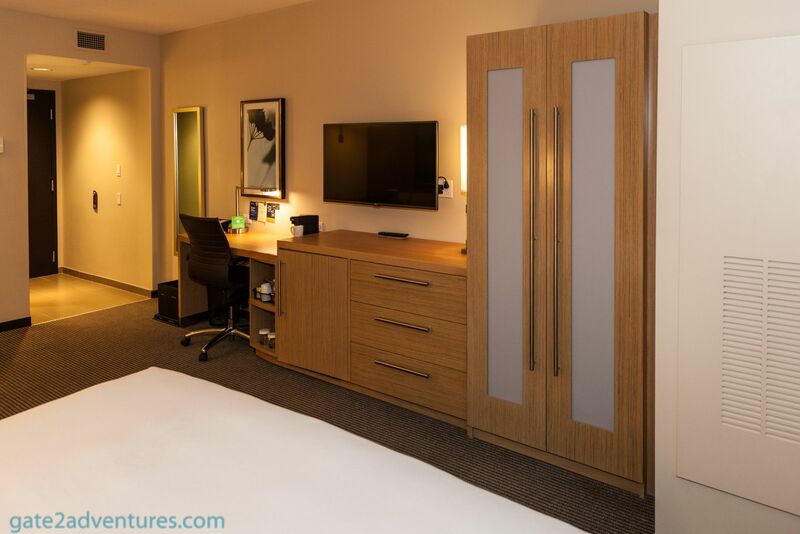 The Hyatt Place Airport East is perfect for a stay before or after a flight. The free shuttle service will pick you up at the airport and drop you at the hotel. 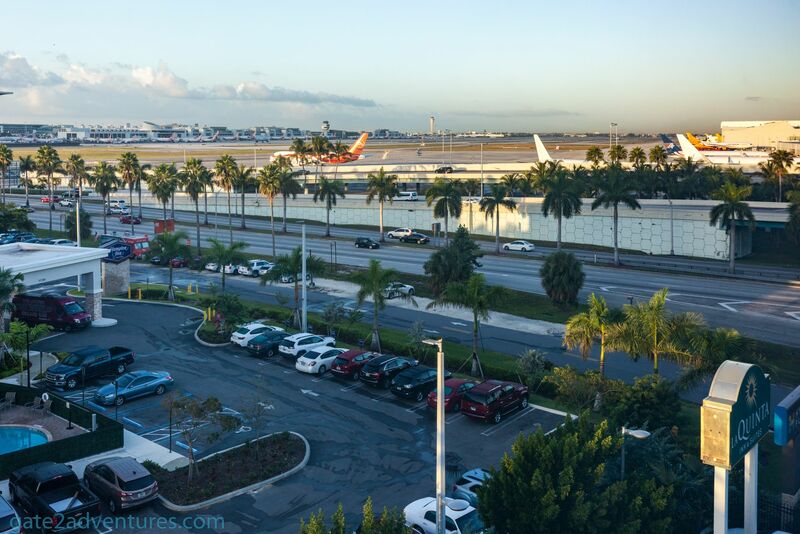 Pick up is located at the Miami International Airport outside gates 5, 14, 24 and 33. Parking here will cost you $20/per night for valet and self-parking. The covered lot underneath the building is actually the place where valet would park your car, but they didn’t seem to have a problem to let anyone in to park here. Considering the price, it doesn’t matter either, as both cost the same per night. 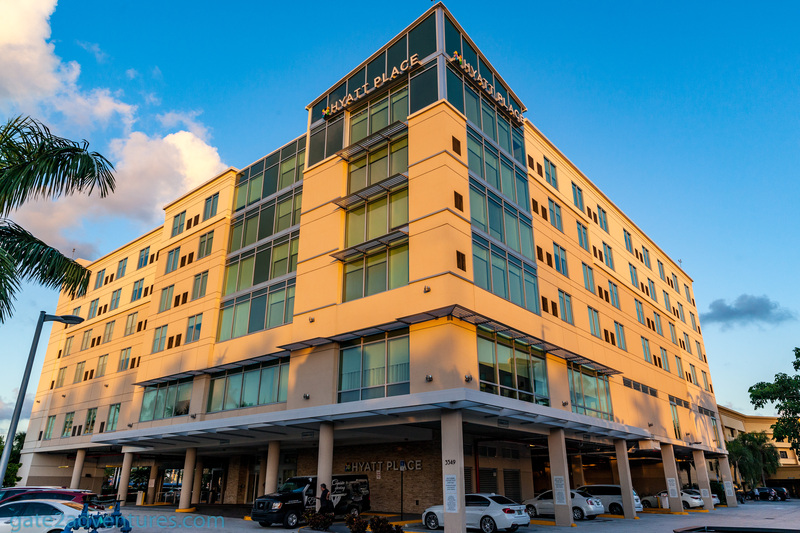 As the hotel is located on a small one-way side road, you have to circle around to get back on LeJeune Road, which will take you to pretty much anywhere you have to go. 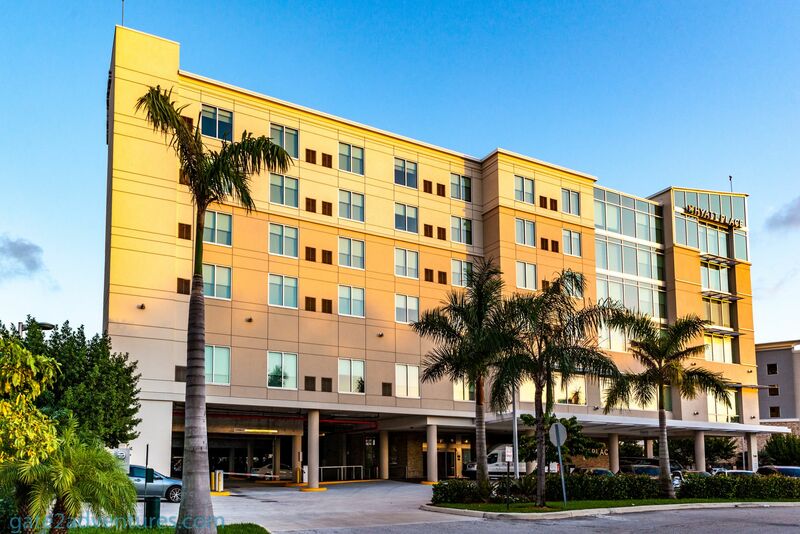 If you are trying to stay in Miami without renting a car, this is the wrong place. Good locations would be hotels in Miami Beach or Downtown Miami because they have easy access to public transportation, less traffic to get to a place or back and cheaper fares because of distance. Staff interaction was great as well as their service. They could have been a little bit more attentive sometimes but overall nothing to complain about. 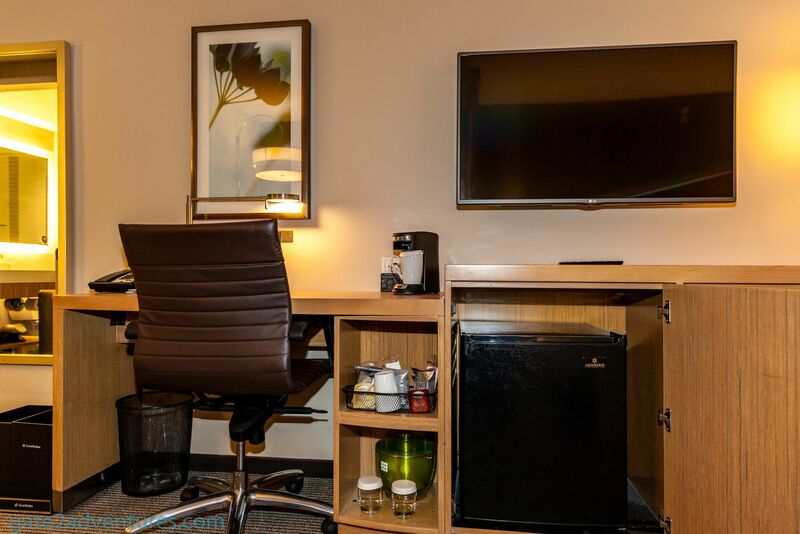 The hotel and rooms are very clean and organized. Pool: Daily from 10 a.m. – 10 p.m.